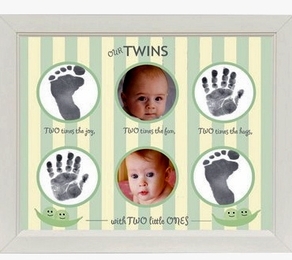 Handprint & Footprint Frame Boy/Girl Twins 11" x 14"
This sweet Twins Handprint and Footprint Frame is the perfect keepsake for two little ones! The white frame measures 11x14 with the heading "Our Twins" and features three-inch die cut openings for each twin's photo with the phrases "Two times the joy," "Two times the fun" and "Two times the hugs" ... with two little ones! Next to each photo is room for their tiny handprint and footprint. Comes complete with child-safe silver ink stamp and instructions. Acid-free. A super gift for a baby shower or new parents and grandparents of twins! Great for mixed gender twins! NOTE: Due to the heavy weight of this item, we can not ship to international addresses. Domestic orders only.